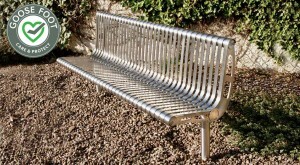 Satin polished stainless steel furniture is sometimes seen as low maintenance. However, a regular maintenance routine is still important and the products should be cleaned every two months at least to uphold their aesthetic appeal. Care should be taken to safeguard both operatives and pedestrians within the working area. An initial risk assessment and associated hazards should be identified as part of the overall maintenance regime, and a safe system of work should be identified/established and adhered to. Wash down with warm soapy water, hose off and dry with chamois leather or lint free cloth. No other cleaner should be required at this stage, subject to environmental conditions and specific areas of heavy soiling or damage. Rust marks or staining on stainless steels is unlikely to be the result of corrosion to the stainless steel itself (similar marks may also be found on porcelain and plastic sinks). These marks are likely to be a result of small particles of carbon steel becoming attached/embedded in the surface. In damp environments and coastal locations, these iron particles rust and cause staining. Rust marks, heavy soiling and light scratch marks can be removed by abrading the surface in the direction of the existing polish grain, using 3M SCOTCH BRITE 07521 A.F.N. abrasive cloth. 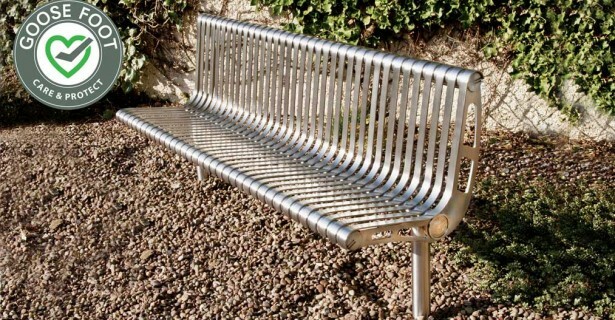 Our range of satin-polished stainless steel seats are engineered to combine rugged all-weather performance with ergonomic profiles. In addition to our standard range, we also specialise in the manufacture of bespoke street furniture products, so if you have a design in mind already or if you would like to discuss your upcoming projects, please feel free to contact us on enquiries@goosefootuk.com or call 01254 700213.